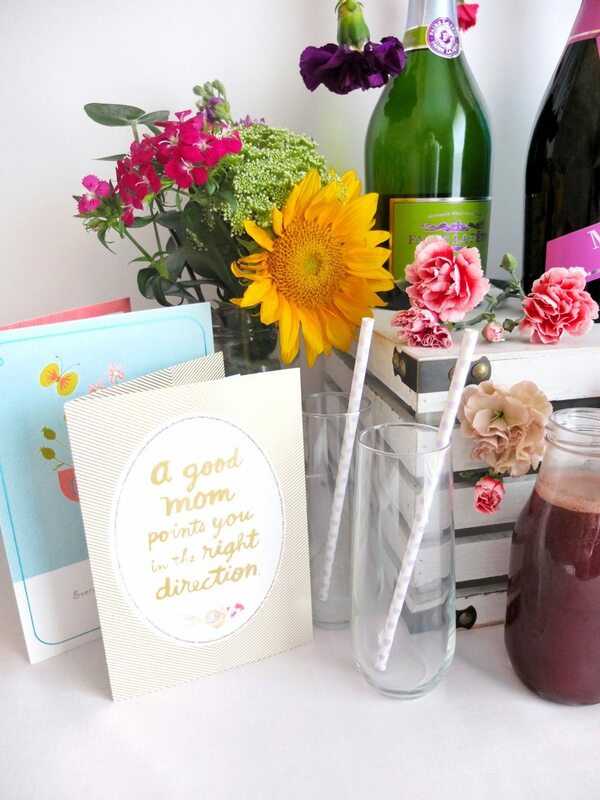 A DIY Mimosa Bar for Mother’s Day using play on words of Mom-osa! 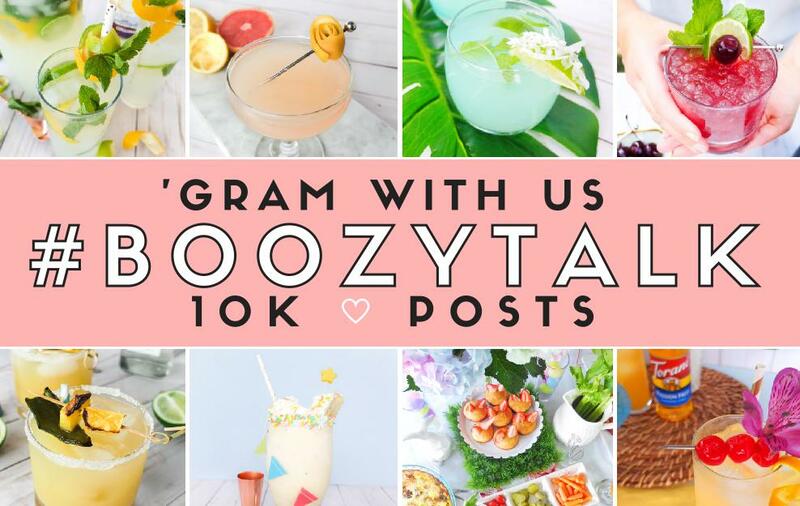 Includes champagne, sparkling wine, mimosa mixers, and a DIY floating flower garland. This post has been sponsored by H-E-B a brand I love and use regularly. All opinions are my own. See the details on the disclosure page located in the footer. Mother’s Day is fast approaching and this year I wanted to create something special for you to share with your Mom or Moms! In true form, what better way would that be than to have a brunch with a Mom-osa Bar. In the past I’ve talked openly about losing my Mother. Which is why I find this holiday so important to celebrate. I have a lot of amazing Moms in my life who help fill that Mother’s love gap. I think taking this time to acknowledge their love and support is a great way to give back to them. So whether it’s your Mom, Step Mom, Mother in Law, Aunt, Grandmother, BFF who’s a first time Mom, or all of them! Let’s celebrate every Mom who makes us feel loved. 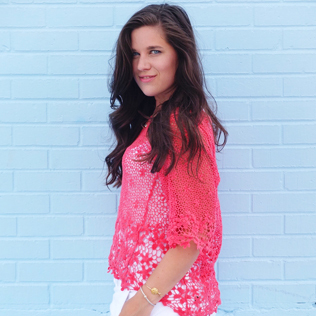 So get the champagne ready because we’re going to celebrate Mom with a few mimosa….I mean…Mom-osas! Let’s start with decor! For this Momosa (Mimosa) Bar, I wanted to incorporate a garden theme because I have strong childhood memories of my Mom having a garden in our backyard. What is about Moms that make us think about flowers? Bonus: Mom gets to take home flowers at the end of brunch. So while I was at H-E-B, since it’s my one stop shop for everything, I went over to their Blooms Design flower section. I picked up two gorgeous sunflower arrangements and a hand full of carnations. To start with this bar, I trimmed down my sunflower arrangements so they would be lower to the table and easier for Mom to carry home. When I want to wow someone I really want to make them say, “WOW”! So to really add to this garden theme I wanted to create a floating flower garland. 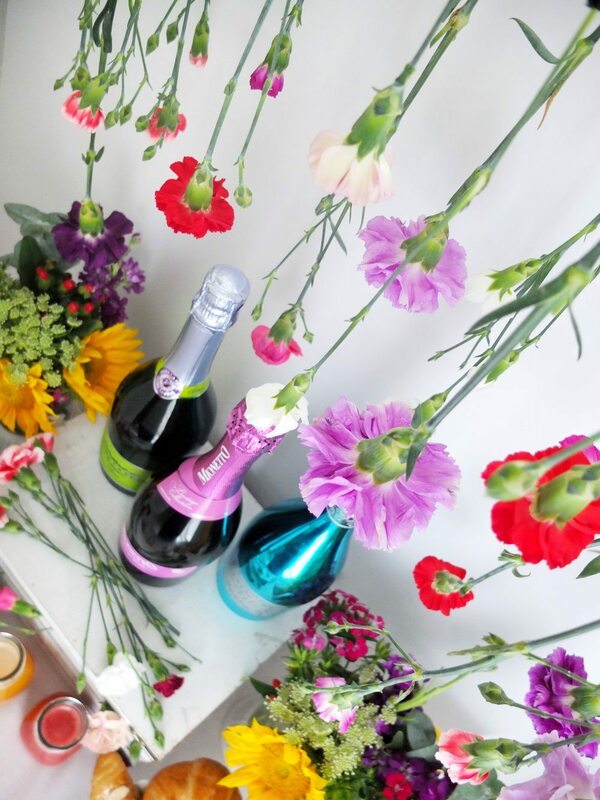 Using the two walls on either side of my bar (you can also just use the background wall) I attached two wall safe stick on hooks to each wall high enough for the flowers to float over & behind where the wine bottles would go. Using fishing line I strung the line over the bar then double knotted it to each hook, making sure my line had no slack in it. Using Florist Tape I then wrapped each steam around the line to hang. I used a more messy approach but arrange them how you like. Tighten the line if it starts to slack and then you are done! Another way I like to decorate is to have cards for each Mom hanging around the cart. If flower garlands are not your thing you could also do a card one! Cards can be a beautiful and functional piece of decor. I love these Hallmark Signature cards I found at H-E-B. I like to write sweet words to the Moms who have influenced me in attendance and of course to the ones far away. Then I sprinkle them through the decor to later be passed out at the end of brunch. So we’ve covered the Mom part of the bar now let’s get to the Mimosa part! 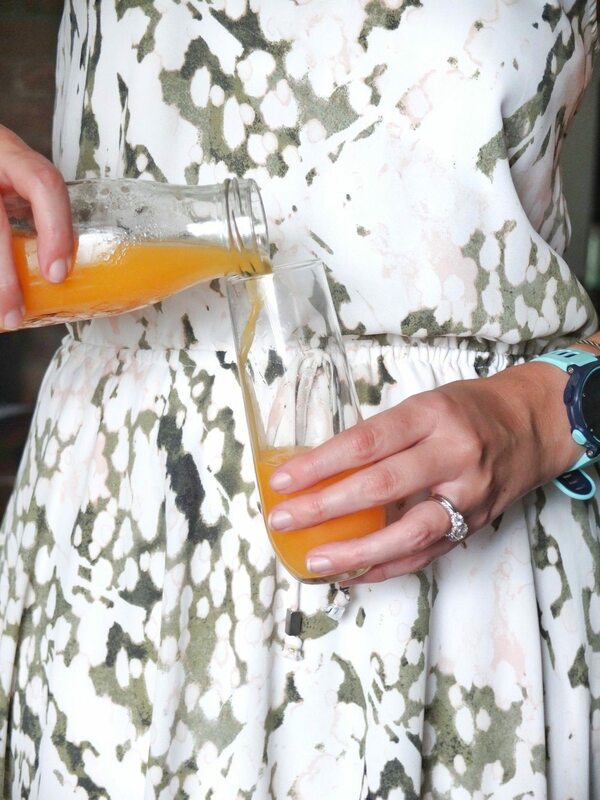 For a Mom-osa you’re going to want to mix equal parts juice to sparkling wine. I personally like making my own juice for a Mom-osa bar because I can get creative with pairing flavors to the sparkling wine. Which means having fun picking out different kinds of bubbly wines. Though I won’t judge you if you pick them out by how pretty their label is. Mionetto Rosé Extra Dry is going to be floral and carry that classic dryness from Rosé. Rosé is known for pairing wonderfully with spicy flavors so I mixed together a juice of Strawberry and Spicy Basil. Faire La Fete is a more tart Brut, which I really like for mornings. To amp up that tart I’ve made a juice combined with Blueberry, Pineapple, and Mint. It’s refreshing with it’s sweet notes but also the perfect tart wake up for brunch. Prima Mazzo Sparkling Brut is a little sweeter with it’s fruity undertones. Beside the bottle being gorgeous, this sparkling wine pairing I wanted to keep classic. I made a juice of just peach and orange to fall somewhere between the notes of the classic mimosa and bellini. Here is how I make the juices! My juice recipes are a mix between juice and puree. You can use a juicer to make a true juice version (double your ingredients & mx in your lemon juice & sugar once fruits are juiced) or use my blender method for a thicker version. 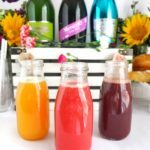 Homemade juices for a Mimosa bar. Into a blender put your strawberries, spicy basil, lemon juice, sugar, and ½ cup of water. Blend on high until adding in more water as needed until the mixture has made a thin puree consistency. Remove the blade and strain the mixture through cheesecloth or a fine mesh sieve into a reusable container. This will remove seeds and bits of basil also while thinning the mixture out more. Put in the fridge until ready to use. Good for 3-4 days. Into a blender put your blueberries, pineapple, mint, lemon juice, sugar, and ½ cup of water. Blend on high until adding in more water as needed until the mixture has made a thin puree consistency. Remove the blade and strain the mixture through cheesecloth or a fine mesh sieve into a reusable container. This will remove seeds and bits of mint also while thinning the mixture out more. Put in the fridge until ready to use. Good for 3-4 days. Into a blender put your peaches, oranges, lemon juice, sugar, and ½ cup of water. Blend on high until adding in more water as needed until the mixture has made a thin puree consistency. Remove the blade and strain the mixture through cheesecloth or a fine mesh sieve into a reusable container. This will remove left over seeds and pulp also while thinning the mixture out more. Put in the fridge until ready to use. Good for 3-4 days. 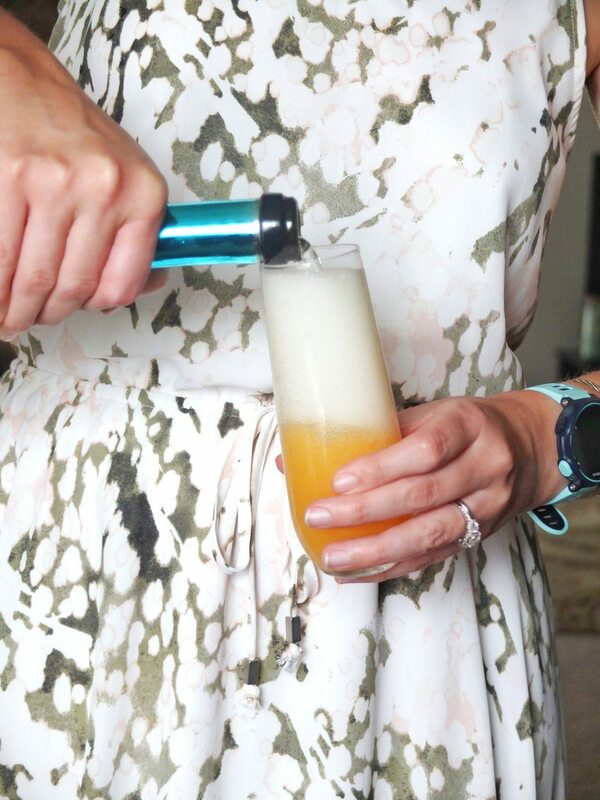 Fill a champagne flute half way with juice and top the rest of the glass with champagne or sparkling wine. Soon to be Mom? Try my Babe-lini Mocktail! Lastly, If you have a big bar you could really go all out with a cereal bar or omelette bar attached to it. For me I just love having fresh pastries of different varieties ready to be picked up. I’m an almond croissant type of girl but I know many cherry scone lovers. I grabbed a variety of fresh pastries from the bakery at H-E-B, then styled them for easy pick up at the Mom-osa Bar. It gives everyone a chance to pair not only their mixers but also their pastry to their drink. I just love how this Mom-osa Bar turned out and that I was able to grab everything right at my H-E-B store. I think this DIY really captures the specialness that is Mom and would be a loving treat to celebrate Mother’s Day. It’s a lot like how we use to make homemade gifts when we were kids, just the adult version. I feel so lucky I get to have the love and affection of so many Moms. I really value each of their strength their delve into me and my life. So tell me down below, tell me how you’re going to celebrate Mother’s Day this year? Are you the Mom? Are you celebrating a Mom in your life? Maybe you’re both!